Airstream Innovation’s patented production system is an agricultural environment based on the principle of positive pressure. Our proven design reduces cost and maximizes profit by combining USDA certified pest-protection, 3D photosynthesis and programmable air flow to optimize transpiration and maximize growth. Our clients enjoy lower start-up costs, faster time to market, and huge productivity gains over conventional alternatives. Airstream is perfectly suited to serve cannabis growers now building large-scale growing operations. We start by capturing the natural wind using tall 360 degree tower check valves that direct air into the structure. Inside the tower variable-speed fans augment the incoming air 7/24 creating a perpetually inflated positive pressure structure on massive scale. 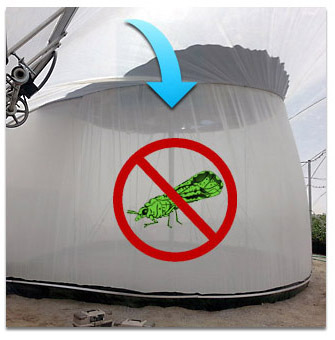 A high-density protective netting wrapped around the inside base of the tower stops pests from entering and diffuses the air flow. The structure is light-weight translucent polyethylene woven fabric cover attached to a skirt embedded into the ground. 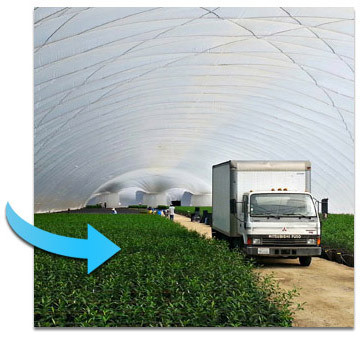 Half-acre tunnels use cables to control the air pressure on the cover. 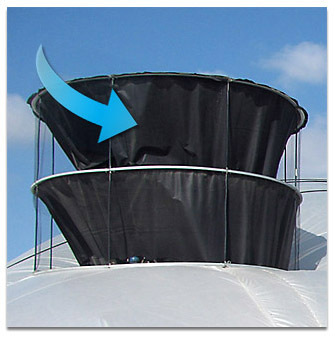 Airflow is controlled by a single vent door at the opposite end of the structure which automatically opens and closes based upon crop requirements. The 12′ x 16′ vent door also provides airlock-free immediate access for vehicles and personnel. A 15 mph/24 kmh wind will sustain the structure. As wind is arbitrary expect 5- 20 kW of power to maintain the proper airflow. In the event of power failure, our integrated backup generators automatically take over. For half-acre models, if the generator fails a battery backup system ensures time to restore power. The translucent cover and its geometry create a 3D photosynthetic effect diffusing light into the lower leaf canopies while preventing over exposure to upper leaves. This results in denser, lusher plants. Airflow is a pillar of photosynthesis. When flowing across the plant canopy at a consistent 4 to 6 mph, you can achieve perpetual transpiration and provide the optimum mineralization to the desired fruit or flowers. Growth is maximized because the plants are never in stress so every ounce of input (minerals) above stress level goes into growing. We have mastered this concept and program the flow for your specific crop. Automation – our propriety programmable control system analyzes and balances the input of the diffusing cover (light and heat) and the humidity produced by the natural evaporative cooling of the plants (water) with one simple programmable vent door. For strains with light deprivation and community light abatement requirements, we offer our optional Greenhouse within a Greenhouse™: a light-duty substructure with a roll-away cover to block natural light. This option provides benefits on several levels including added security, deflation protection, and separately controlled ventilation for maximum control. Beyond the immediate benefit of the commercial use of the Airstream Innovations greenhouse (more profitability for the grower), We see advantage to the world by promoting sustainable, local, and flavorful food production on a global scale. These benefits include: reduced transportation, fuel consumption, emissions and chemicals for a healthier environment and people through the production and consumption of safe, flavorful, organic foods; and more stable local economies and societies. We like to think of this as Beyond Business. Copyright © 2019 Airstream Innovations, Inc. All Worldwide Rights Reserved.